Responding to a cardiac issue can be a matter of minutes to ensure a patient’s survival. The faculty and staff at Bernshausen Elementary School are working to practice their skills if and when the need ever arises. “The important thing that we really talked about is that cardiac arrest is it’s awful, but it can be reversed. It’s just within a few minutes. We have a very small window of time,” said Elizabeth Goedde, a nurse at Bernshausen. The American Heart Association estimates that more than 350,000 cardiac arrests happen across the country a year, which kills about 90 percent of people who suffer from them. With cardiopulmonary resuscitation, a person’s probability of surviving can double or triple, according to the AHA. All members of the trauma team are CPR certified to help respond to any emergency. Around the school, 27 faculty and staff members make up the trauma team to respond to a medical emergency by using CPR and employing a defibrillator, if necessary. Klein Independent School District has added healthy and safety as part of their health and safety initiatives. Project Adam, a nonprofit that advocates for the prevention of sudden cardiac death, recently recognized the trauma team at Bernshausen Elementary for their preparation to cardiac-related emergencies. When a drill is performed, an announcement is made over the loudspeaker to get trauma members to respond to a location within the school. Like fire drills, students are expected to remain calm while a faculty member leaves the room to attend the emergency drill. “It could be an emergency across campus or multiple emergencies going on at the same time. Having equipped faculty and staff members to handle that is important,” said Bernshausen principal Cassandra ChristianCQ. During drills, team members get hands-on practice to react to a real-life situation. The first members to arrive evaluate the situation and may begin chest compressions as the next members who arrive may assist as needed and dial 911. In all, team members have responded to the drills in under three minutes, Goedde said. “(We learned) the proper way to deliver immediate services, how to stay calm when we respond, how to assess the situation,” said Erica Scott, a school counselor. While faculty and staff continue to train and prepare, the thought of having to put those skills to use in a real scenario is sometimes nerve-wracking. 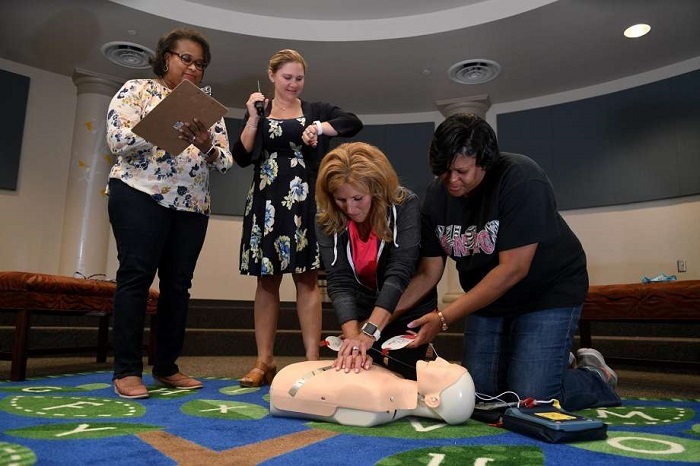 “As you’re going through the drills and the CPR training every year, first aid training every year, I know I’m thinking, ‘Oh lord, I hope I never really have to use this.’ You’re also thinking because we’re around kids every day, I pray I never, never really have to use this,” said assistant principal Amber Standley. While faculty and staff are trained to respond to an emergency, Goedde said she also plans to teach students how to respond to a situation outside of school that may occur at home or in public with other family members. Exposing students to how CPR is performed and how it helps a person can help make it less intimidating. “It makes you less afraid the next time you see it,” Goedde said. The first class will consist of 14 students ranging from kindergarten to the fifth grade. Knowing when and how to dial 911 during emergencies is also useful for students to learn to help save lives. “They can help save lives as well,” Christian said.